Including this verse, the name Haman is mentioned in 6 places in the Qur’an: The name Haman is mentioned in the sixth and eighth verses of al-Qasas; in the 39th verse of al-Ankaboot; in the 24th and 26th verses of al-Mumenoon; and it is informed that Haman is the vizier of the Pharaoh. Did a person named Haman really live? And did this person have any relation with the Pharaoh? What do history books inform us about this issue? The symbols of the ancient Egyptians used to write the words are called “hieroglyphs.” The ancient Egyptians, Hittites, Mayans and Aztecs used to use the writing of hieroglyph. The Hieroglyph is a writing which is composed of primitive pictures and signs that represent ideas about various creatures and objects. Despite the efforts of giving proper meanings to the pictures, hieroglyph is a very complex writing. The history and language of Egypt changed completely with the invasion of the Roman Empire. The Rome developed a prohibitive attitude towards the religion of ancient Egypt because of paganism. They destroyed the temples of Egypt as well as their tablets. They prohibited the use of hieroglyph writing. After AD 300, the writing of hieroglyph was forgotten and nobody who could read this writing remained on earth. This continued till the 18th century. Since there was none who knew this language, nobody had an idea about what the Egyptian papyruses and writings said. This changed with the scripture of “Rosetta Stone”, which was found by a French soldier who was digging a shelter for himself during the invasion of Egypt in 1799. The characteristic of this scripture which differs from other scriptures is that the same text was written both in Hieroglyph and demotic as well as in Greek. Since the language of Greek is well known, the scripture of hieroglyph was decoded by a Frenchman called Jean-Françoise Champollion. By this way, a great deal of knowledge about ancient Egypt and thus Pharaoh was acquired. Through the decoding of hieroglyph, an important piece of knowledge was revealed. The name “Haman” was indeed mentioned in Egyptian inscriptions. This name was referred to in a monument in the Hof Museum in Vienna. This same inscription also indicated the close relationship between Haman and the Pharaoh. The German scientist, Walter Wreszinskiwho analyzed the Antic Egyptian Culture and whose works were accepted as a masterpiece of Atlas stated that the name of Haman was mentioned on a monument of Hof museum and on the same monument the close relationship between Haman and the Pharaoh was mentioned. 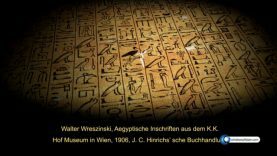 And Hermann Ranke, who is also a historian expert in ancient Egypt, mentions Haman as the head of the stone quarry workers in his “Dictionary of People in the New Kingdom”, which was prepared based on the entire collection of inscriptions. Yes, Haman was a person that lived in Egypt during the time of Hz. Moses as it is mentioned in the Qur’an, He was very close to the Pharaoh as it is mentioned in the Qur’an and was occupied with the construction works. The verse which informs about the demand of the Pharaoh from Haman about constructing a tower is in complete coherence with this archeological information. Now we want to ask the following question: the Prophet Muhammad (PBUH) did not know how to read and write; he did not read or write a single line. However, a person who lived in ancient Egypt and was the vizier of the Pharaoh is mentioned in the Quran by his name. This mentioning is in complete coherence with the historical finding made 200 years ago. History tells us about a person called Haman living in the same period as the Pharaoh and that he was the vizier of the Pharaoh and was occupied with construction works. How can it be explained that the Quran miraculously mentions some information that could not be known at the period when it was sent down and that the same information is mentioned in the ancient Egyptian scriptures? It can be explained only as follows: The Quran was sent down by Allah, who knows what is unknown and unseen. It is His book and word.